After working at English hospitals at Walton-on-Thames and Codford, Grey was sent to France, where German planes came too close for comfort. Elsie Prudentia Grey was born in 1889. She attended Wellington Girls College, then moved to Auckland to start nursing training. After working at the Auckland Public Hospital, Grey headed to the United Kingdom in April 1914. She worked initially at the New Zealand War Contingent Hospital at Walton-on-Thames in Surrey as a member of a Voluntary Aid Detachment, or VAD. The VADs’ contribution was enormous and the work they did was often as gruelling and skilled as that of the trained nurses they worked alongside. VAD duties ranged from scrubbing floors and cleaning surgical equipment, to dressing wounds and comforting patients. The hospital at Walton-on-Thames was set up in the old stately home of Mount Felix, and it soon began treating the sick and wounded from Gallipoli. New Zealand may rest assured that at Mount Felix the wounded men are happy and contented, and receive the best of care… The hospital, in fact, is fully equipped with the latest appliances for the alleviation of pain and suffering, and an X-ray apparatus is to be installed at once. The staff is kind and considerate, and the New Zealand atmosphere which pervades the place is the best tonic that the patients could possibly have. Codford is 106 miles from London and the Hospital is situated in a Valley at the mouth of an Iceberg. When I arrived here I was shown to my room – very up to date one too – wardrobe with mirror washstand dressing table and nice bed. I was favourably impressed until I got into bed and I didn’t sleep – I froze, all the huts are corregated [sic] tin stuff and you do feel it. The Hospital is the same. It has been bitterly cold all the time. The boys are being sent in from “Sling Camp” absolutely in the last stages of Pneumonia and of course it is too late and we cannot pull them through. It is terrible to see these young boys dying – most of them are late reinforcement boys and have only been here two or three weeks. Codford did not generally receive serious cases. Its distance from the ports of Southampton and Dover, plus its smaller capacity, meant that badly wounded men from France did not go there for treatment. Instead, they looked after men who injured themselves or who fell sick during training. Attached to Codford was a Venereal Disease Section, a detention hospital enclosed by barbed wire and constantly under guard. This opened in October 1916 – the same month Elsie Grey arrived at Codford. 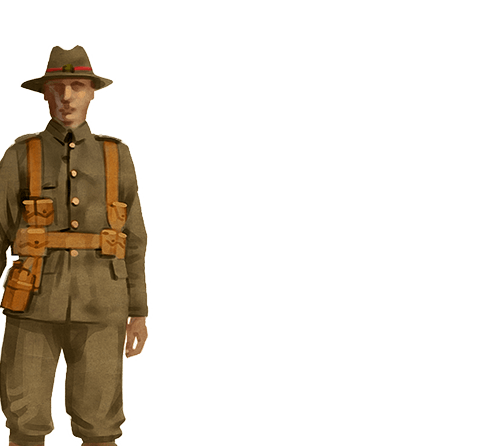 There has been a great amount of sickness and very ill patients from the camps, New Zealanders, Australian and English Tommies. The hospital started with 350 beds, but it is to be increased to 500. There were twenty-six sisters in the staff, and ten extra from Egypt temporarily, and every one was getting ten days leave. The camp is only half an hour by train from Salisbury, and two hours from Bath, so the sisters spend their days off at one or the other. After formally enlisting in the New Zealand Army Nursing Service in February 1917, Grey was sent to France with the No.1 New Zealand Stationary Hospital, and was close to the fighting. There was a Hun plane directly overhead and the anti-aircraft and machine guns were thundering up at it with terrible force. Oh it was terrifying – the shrapnel was falling in all directions. The whizzing bullets sounded like dogs howling, and the ghastly din continued for the next two nights, though the nurses were moved inside out of the tents. I am sure I would have got shell shock if I had stayed out there much longer. 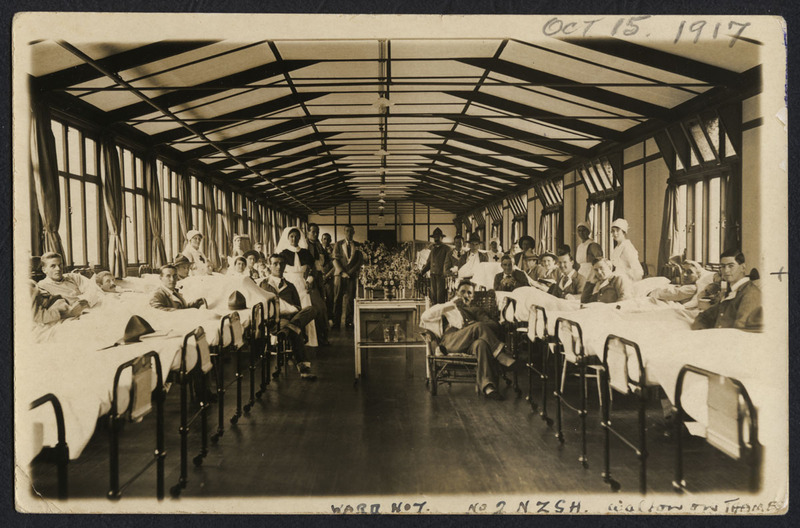 German shelling of Hazebrouck eventually forced the evacuation of the No.1 New Zealand Hospital, and Grey was later transferred back to the No.2 New Zealand General Hospital in England. When the war ended in November, she was working in a hospital in Staffordshire, looking after troops from nearly military camps – including Brocton Camp, the training centre for the New Zealand Rifle Brigade. She arrived back in New Zealand in July 1919, and left the New Zealand Army Nursing Service the following month. Elsie Grey died in Auckland in 1949, aged 62.